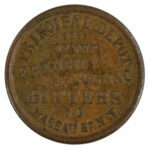 This token was issued by a man named Ira Mayhew (1819-1894) who founded the Albion Commercial College in 1860. This college was not affiliated with the current Albion College. Mayhew published a book called Mayhew’s Practical Book-Keeping, which became one of the most popular books on the subject in its day. Mayhew’s college operated in Albion until 1868, when it mysteriously burned. Mayhew then moved his operations to Detroit. MI 25-A-1-a, R-3.